Warning: reading this might lead you to lose faith in the media and marketing world! Oh – you didn’t really trust them to begin with? Well, let’s dig right in and meet the now-removed Twitter account from @AI_AGW. He’ll hold an intelligent debate about global warming with you. But as smart as he is, you may be surprised to find that he is, in reality, a bot – a computer program. Bots like him cannot only talk to you, they can easily skew algorithms, influence your opinion – or, in some cases, cause a lot of trouble. Before we dig into the dark world of bots, let’s find out what they are. Bots are algorithms acting in social media networks. But to the outside world, they look like a real user. They can come in all shapes and sizes, and they are borderline perfect. Some of them are very simple. And there are loads of services that will offer you bots, ranging from bots who will like whatever you post and fake followers to much more. Building them is easy. You can actually try this at home. All you need is IFTTT.com account, along with an RSS feed and maybe $10USD for 1,000 fake friends – all of them bots (Watch this movie to learn about @spotthebot and how he was built). Or better yet, download your very own bot software to wreak havoc on social networks in the comfort of your own home, within mere minutes. Much of this is even freeware (check out GitHub, for example). If you need a bot that can actually do conversations with you or others and pretend to be a human, you might check the Gonzales tutorial for code. Social media bots can be scarily natural. A study showed that 30% of users can be deceived by a bot . Well made bots can even gain your trust. For example, meet Lajello, a fictitious member in a book lovers’ network. He became the second most liked and appreciated person within this network. Why? Because he automatically recommended books to every other user like an Amazon recommender system. Lovely and friendly, right? Thus it should not be a surprise that 1 in 5 of us accepts unknown friend requests, openly letting bots into our world. Bots are actually more common than you might think. Twitter is fighting bots via either legal actions or various machine-learning programs. 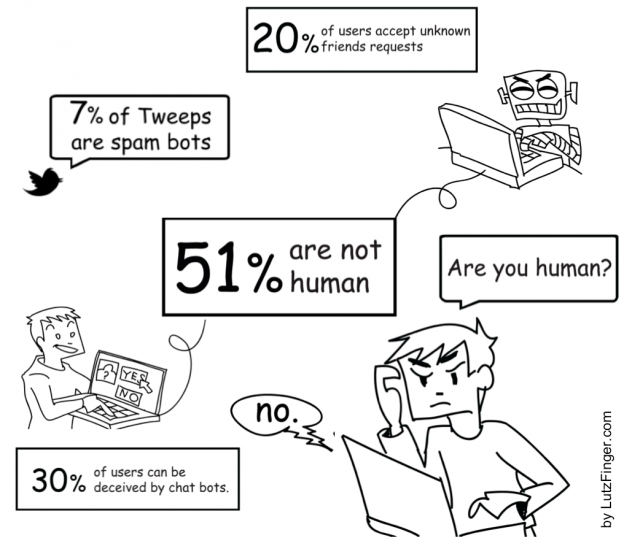 Still, from time to time, researchers dig in and find that, for example, 7% of tweeps are non – human but spam bots. Companies like statuspeople (@statuspeople) have built lists to actually spot fake Twitter followers, and you will be surprised to see how real some of them look. For example, 99.9% of @spotthebot’s followers are fake … check them out. They are all bots! Can bots make you famous? Oh yes they can. Read here about how Chris Dessi (@ChrisDessi) created some fame with as little as 50k followers. How about when bots persuade you to buy stuff? This is similar to email spam, or the nagging calls from the insurance companies to please buy their life insurance. To harm others, even very simple bots can be useful. Just sign your worst opponent up with a lot of fake identities and help the world discover it. Newt Gingrich, Mitt Romney and the German Conservative Party (CDU) are just some examples of cases where fake-following was proven or assumed to have happened. One of the real impacts of bots is to skew public opinion. If you have built an army of bots that like, read, and engage on a set piece of content, you might as well influence what is trending. China tried this with the so called “5 Mao (50 cent) army“: over a quarter million bloggers who wrote articles for as much as 5 Mao per article to complement its government information politics. With my former startup (sold to WPP ) I had investigated this army for various clients and we saw a steady decline of their power. Perhaps they were replaced by bots? This is not as unlikely as you would think. During the Arab Spring movement, we measured how the government was disrupting protesters’ activities with continuous tweets. By spamming the “stream” with tweets, important messages sent by activists were pushed lower on the page and out of sight by an automated system. It is safe to conclude that the bot business has now gone beyond the scope of marketers looking for fame and sales success. In fact, bots are now big government’s business. For example, the US Air Force revealed that it solicited Ntrepid, a California based company, to create software that would enable it to mass-produce bots for political purposes. If there is one common denominator between these various uses for bots, it is that they all clone human activity in the limited world of social media. On a large enough scale, they might skew the ‘trending topics’ algorithms of various social media networks – and according to this survey, journalists often trust these trends. Think about the power if the tweets from your bot come up in google search results (now possible since google and Twitter signed a deal to make tweets more searchable). Thus the real power over the media is owned by the ones who run millions of social media bots. Next week we will look into how one can spot bots and we will discover that some social media gurus have a lot of fake followers. If you cannot wait – just sign up for my newsletter or read chapter 6 in my book “Ask Measure Learn” by O’Reilly Media. This entry was posted in Blog on February 18, 2015 by Lutz Finger.